Dedicated to building and maintaining a strong responsive VeriCoin Community that helps VeriCoin ultimately succeed - becoming the Digital Currency of the future. 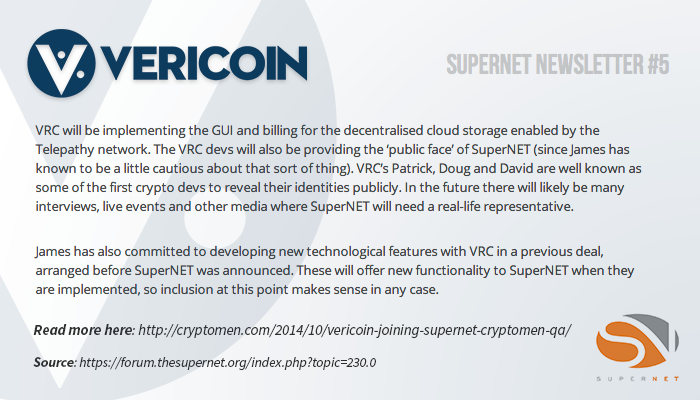 BitCoin, LiteCoin and now, VeriCoin. Satoshi would be proud! Our friends over at iHash.co have just added VeriCoin as a payout option. This build has a couple of bug fixes and code changes. If you're upgrading from 1.4.1.4, you only need to uninstall 1.4.1.4 and install 1.4.1.5; there's no need to delete any files in the data folder or download the bootstrap files. Read below for more details. What changes were made in 1.4.1.4? 1.4.1.4 fixed a vulnerability in the protocol where a buffer in variable interest amount could be exploited on a hacked version of the wallet to gain more interest per stake. This was fixed and the network and wallet are more secure and stable then ever before. What changes were made in 1.4.1.5? This build addresses the sync issues that many users have been experiencing with 1.4.1.3. Edit: This version has a bug that affects network syncing. Please wait for the next version (probably 1.4.1.4), which will address this issue. If you have already updated to 1.4.1.3, we recommend closing the wallet and waiting for the next release which *should* be out today.